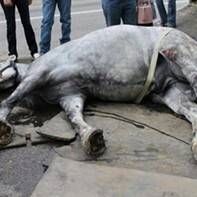 In summer 2013, Jerry, a 13-year-old carriage horse, collapsed on a busy street in downtown Salt Lake City. Jerry would die shortly after the incident, but it's been a long time coming for activists and animal lovers in finding redemption in Jerry's death. But on Tuesday night, the Salt Lake City Council unanimously voted to ban horse-drawn carriages in the capital city, with the exception of parades and certain free-expression activities. During public comment, a few people stood up to speak against the proposed ban and for horse-drawn carriages, but they were outnumbered by a large margin. Dale Greenwell of The Carriage Establishment, a Kaysville business formed in September, also spoke against the ban. “In the years past, during the holidays, more than 30,000 riders have enjoyed carriage rides, not mention weddings and anniversary celebrations throughout the year,” Greenwell said, going on to challenge the council to consider alternatives such as closing down busy streets during the holidays or adding protective lanes for horse carriages. But numerous others applauded the council's call for a ban. One activist thanked the council and updated them on a petition to ban horse-drawn carriages in the city that has now garnered more than 30,000 signatures. It was a point echoed by Matt Bruce, a representative of People for the Ethical Treatment of Animals, who pointed out that the death of Jerry the horse was not an isolated incident when weighed against similar stories across the country. The council had taken a more measured approach in 2013 when council member Charlie Luke proposed a variety of regulations requiring breaks for horses and restricting them from working in bad weather or during high-temperature days, but those proposals were shot down by the council. In September, however, Carriage for Hire, the city's only horse-drawn carriage company, went out of business, and the council then moved to ban carriages in the city outright. Council member Lisa Adams pointed out that she had voted against Luke's earlier proposal but now supported the ban because it wouldn't affect an existing business. She wasn't the only one, as the council unanimously voted in favor of the ordinance, effectively banning any new horse-drawn carriage companies from setting up shop in Salt Lake City.